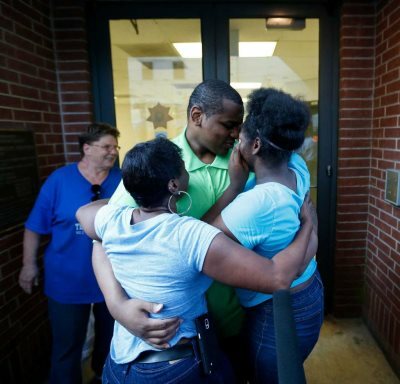 Alfred Dewayne Brown being reunited with his family. AFRICANGLOBE – Special prosecutor John Raley has completed a report finding ex-death row prisoner Alfred Dewayne Brown actually innocent, according to current and former Houston police union chiefs Joe Gamaldi and Ray Hunt. The Harris County District Attorney’s Office was set to release the bombshell results of the months-long investigation on Monday, but stepped back at the last minute, Hunt said. Two sources familiar with the case confirmed the union’s claims. Brown, now 36, was sentenced to die in 2005 for the alleged killing of Houston Police officer Charles Clark during a botched check cashing store robbery. He spent a decade awaiting execution before his conviction was tossed after a police investigator turned over evidence – phone records that might have confirmed Brown’s alibi – found in his garage during spring cleaning. Instead, he sued the DA’s Office, the county, the prosecutor and police. But then, in the course of discovery for the lawsuit, the district attorney’s office found a 2003 email showing that former prosecutor Dan Rizzo may have known about the phone records and failed to turn them over to the defense. The high-profile attorney has practiced law for 35 years and is best known for his work on the Michael Morton case and other wrongful convictions – a fact that Hunt hit on repeatedly in his heated criticisms. Hunt declined to name the source of his information, aside from averring that it was “credible.” His claims come days after the State Bar ended its investigation into the former prosecutor. Rizzo’s attorney did not return a phone call Sunday, and Brown’s attorneys did not offer comment. When Brown was convicted in 2005, prosecutors said that he’d executed the police officer, while his co-defendant Elijah Joubert shot to death store clerk Alfredia Jones, who had just returned from maternity leave. Both men were sent to death row, while a third co-defendant – Dashan Glaspie – got a 30-year sentence in exchange for his testimony. But Brown always said he was innocent and that he’d been at his girlfriend’s apartment just after the murders. The proof, he said, was in a phone call he’d made to his girlfriend at work that morning. For years, officials claimed they had no records of that call. But then in 2013, investigator Breck McDaniel uncovered the phone records in his garage. At first, prosecutors said the evidence had been inadvertently misplaced and not intentionally concealed. But earlier this year, Ogg’s office recovered a 2003 email showing that McDaniel had told former prosecutor Dan Rizzo about the phone records well before the case went to trial. It’s not clear whether Rizzo read that email, but two days after receiving it he signed a four-page subpoena order almost identical to one attached to the email. The only difference, records show, was a half-sentence deletion, removing a line McDaniel said he wasn’t sure about in his message. Rizzo’s attorney, Chris Tritico, has consistently maintained there’s no indication his client read the email, and this month the State Bar dropped its probe into the matter. County attorneys alleged the phone call didn’t prove Brown’s innocence because it was actually a three-way call, showing he was not home at his girlfriend’s, an assertion stemming from a new expert analysis Brown’s lawyers immediately called into question. It’s not clear if that’s one of the issues Raley might explore in his report – and it’s still not certain when the findings might be released.